For readers who don’t know our personal bias, we generally prefer hard-side non-slide truck campers. 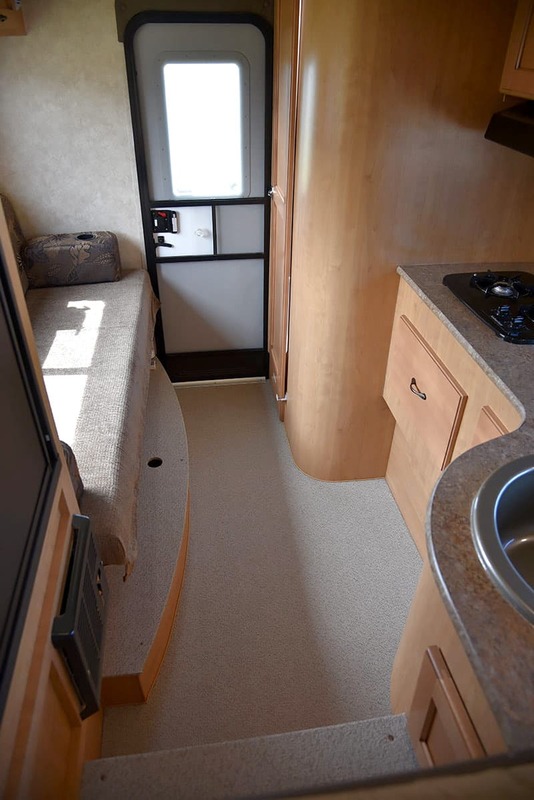 Slide-outs open up an incredible amount of floor space and offer floor plan possibilities that would otherwise be impossible, but they also add weight, reduce interior and exterior storage, challenge structural integrity, and require routine maintenance. With that stated, it’s little wonder that we were instantly attracted to this camper. 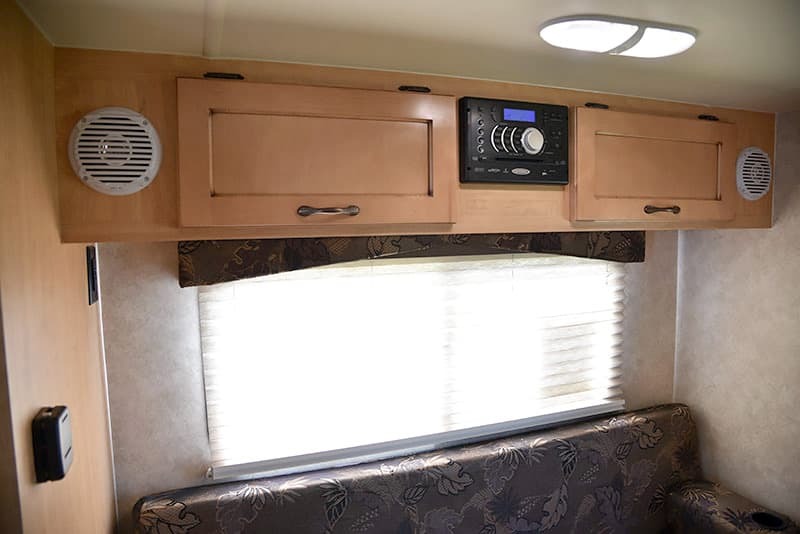 The Adventurer 80RB floor plan demonstrates a strong understanding of time-tested and proven old school truck camper design while embracing the possibilities of modern CAD, materials, appliances, and manufacturing. 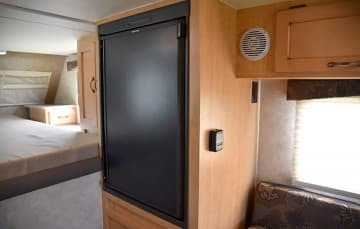 It would be fun to send an Adventurer 80RB back in time, say to the 1970 National RV Trade Show, and have the founding truck camper fathers see how their design influence echoes into the future. If we only had 1.2 gigawatts. 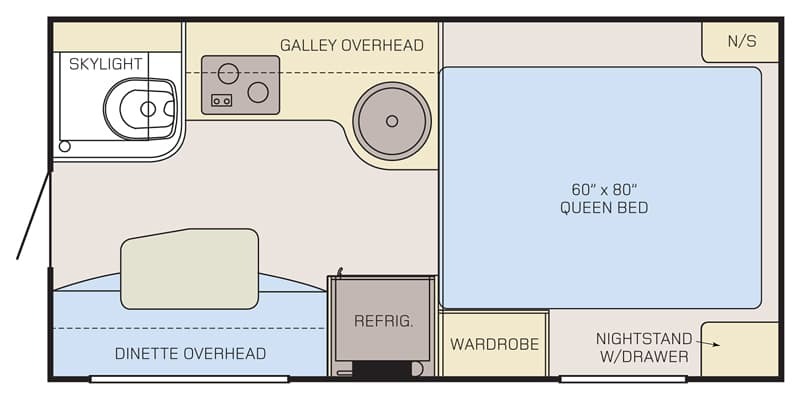 Looking at the floor plan, I am first struck by the sheer volume of counter space in the galley. 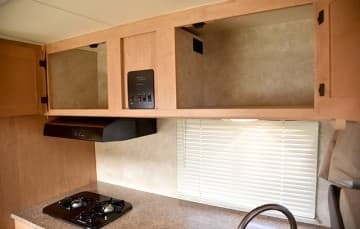 The 80RB has more food preparation area than many multi-slide campers. 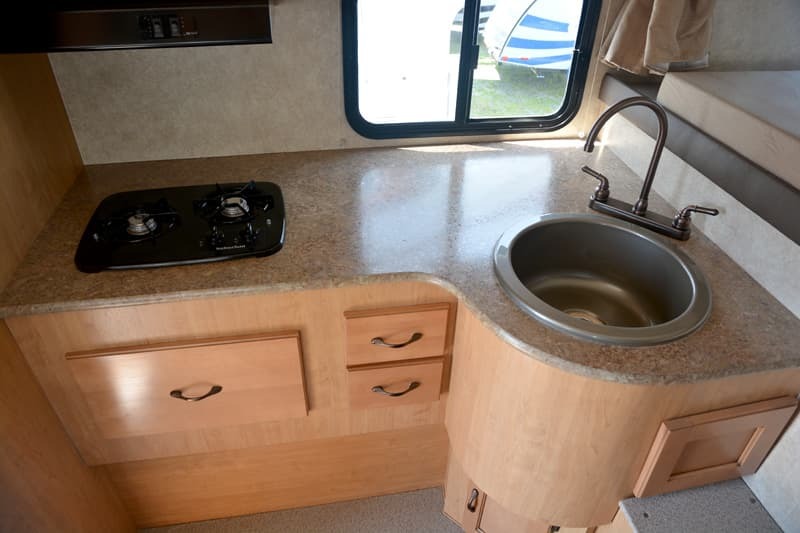 I also think the choice of a two-burner cooktop and round sink is perfect for a unit this size. As someone who has cooked many a meal in a truck camper, I have never used more than two burners. Then again, I am not a gourmet chef by any measure. Is that a sofa? Yes it is! That makes the Adventurer 80RB a genuine sofa camper. 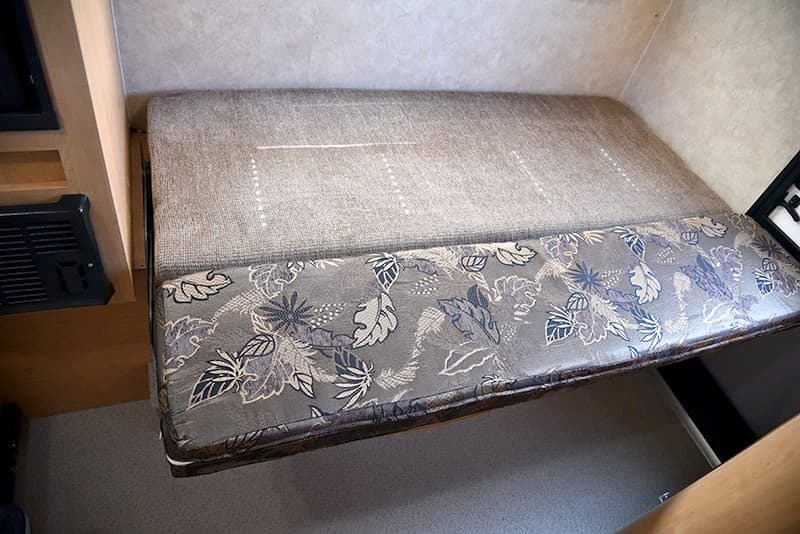 The roll-over sofa quickly pulls down into a bed and pushes back up into a sofa. With this approach, you lose the face-to-face dinette that many (including us) prefer, but you gain a place to sit comfortably and watch television, read, or just relax. 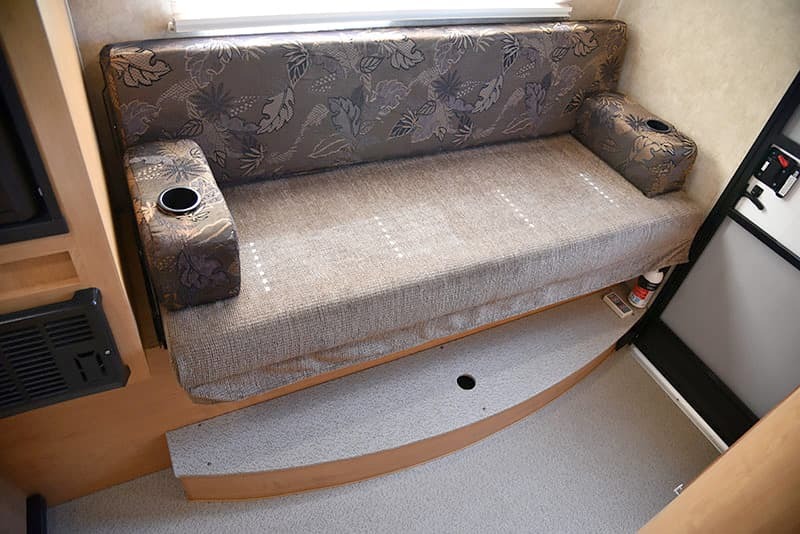 Above: The 80RB is a sofa camper. The table and table leg are easily removable. 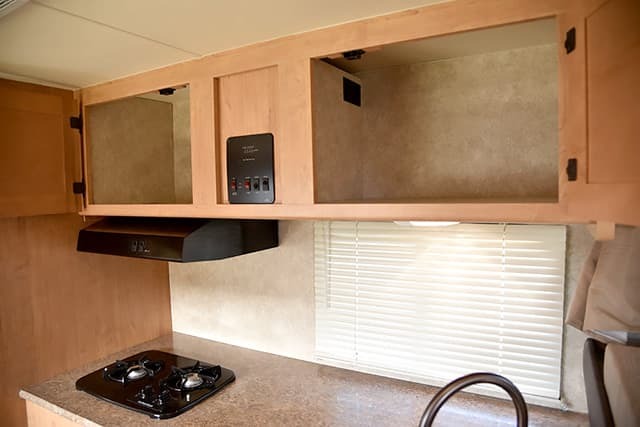 We have a face-to-face dinette in our camper and use it every day for meals and work, but boy do we wish we had a sofa to relax after hours. The roll-over sofa and table is a smart dual-purpose solution. 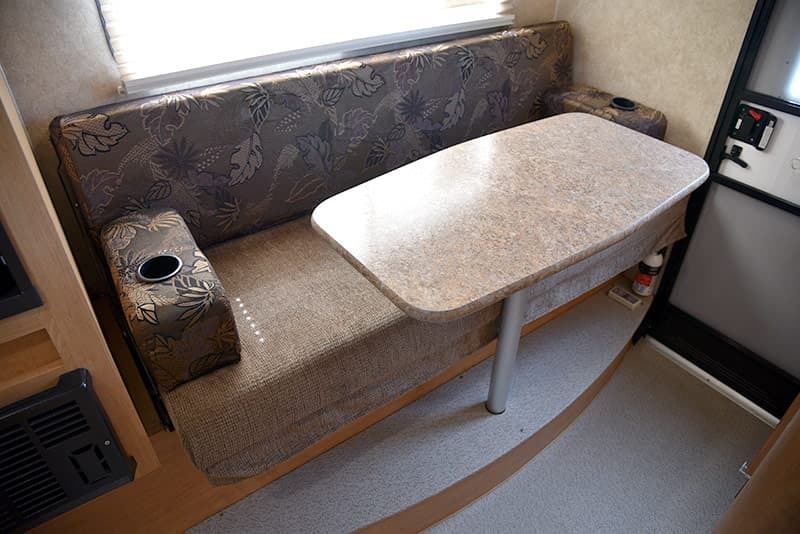 If we didn’t work full-time in our camper (with dueling laptops and paperwork), we would prefer this dinette and sofa solution. Between the dinette and the cabover bedroom is a four cubic foot two-way refrigerator. 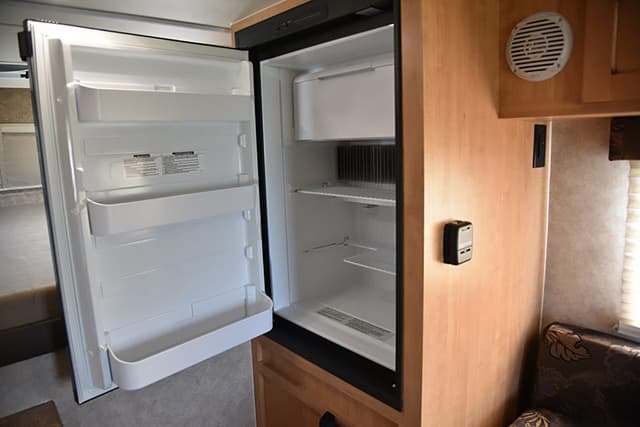 For a camper this floor length, this is a perfect-sized refrigerator; a smart balance between capacity and weight. 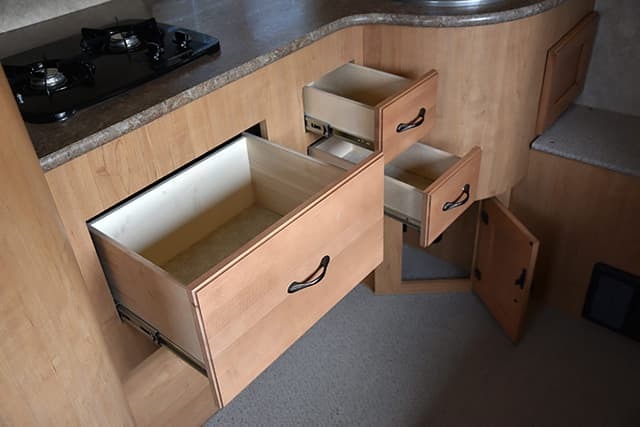 For most couples, four cubic feet should be enough storage for about a week’s worth of cold food. 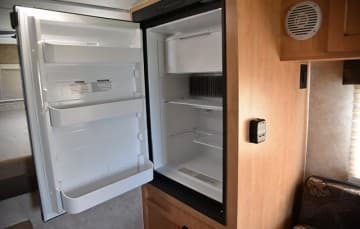 You may have to store some of your beer outside the fridge. Just don’t forget to replace a cold beer with a warm beer. Warm beer is no fun.